A TV illusionist may be behind a bizarre advert which has appeared in four regional dailies, it has been suggested. 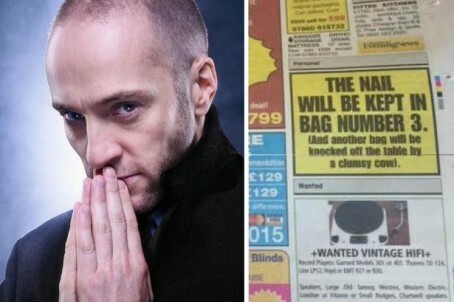 The notice, which appeared on page 43 of Monday’s Manchester Evening News, has led the newspaper to speculate it may be the work of Derren Brown. The advertisement, printed in black capital letters on a yellow background, reads “the nail will be kept in bag number three”, while beneath it continues “(and another bag will be knocked off the table by a clumsy cow)”. The same notice has also appeared in the Liverpool Echo, Western Mail and Essex daily The Echo. Brown is due to appear at Manchester’s Lowry Theatre tonight and inquiries by MEN reporter Alexandra Rucki established that the ad had been placed by a mystery woman from London. Brown’s agent declined to comment, but it has since emerged that his representatives purchased 600 copies of Monday’s edition. Wayne Ankers, the MEN Associate Editor for News said: “Now we are fully immersed in the digital world all our reporters regularly pick up tips from Twitter and Facebook. “But they are also trained not to forget the traditional methods of finding a story. “This includes going through the public notices and BMDs on a daily basis and Alex was the first to spot this strange advert. Yes it is Derren Brown. I saw his show in Newcastle and the ad was in the Chronicle – copies were given away at the end of the show with the ad in and some other stories which had been used in the show. But surely running story before the show spoils one of the best tricks in the show. Should have run the story tomorrow – how the MEN helped Derren Brown. I am afraid that I totally agree. Why spoil part of his act by trying to look smart? Far better to have waited until after the show (attended by perhaps a couple of staff who could have been in the audience and perhaps directly involved)?